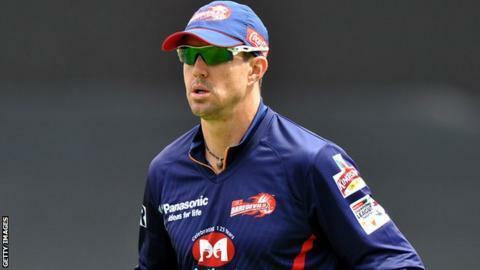 Kevin Pietersen will join up with the England squad in India on Sunday after the Delhi Daredevils were knocked out of the Champions League Twenty20. Despite hitting 50 runs off 44 balls, he could not prevent his side losing by 22 runs to the Highveld Lions. Pietersen, who hit three fours and one six, confirmed the news on Twitter. "Apologies to all the Delhi Daredevils fans. We should have done better today. On a more positive note, I'll be in India Sunday. Can't wait!" he said. The 32-year-old was recalled to the squad last week after a series of "constructive and cordial" meetings with coach Andy Flower, Test captain Alastair Cook and other senior players. He was dropped from the England squad in August after having had to apologise to former captain Andrew Strauss for sending "provocative" text messages to opposing players during the Test series against South Africa. England will play four Test matches in India starting in Ahmedabad on Thursday 15 November.